Collect them all! Each Playmobil 9146 Fi?ures Mystery Action Figures Boys Series 11 figure is a fun surprise. Just pop open the bag and you'll get one of 12 awesome mystery figures with accessories. Just assemble it and the fun begins! 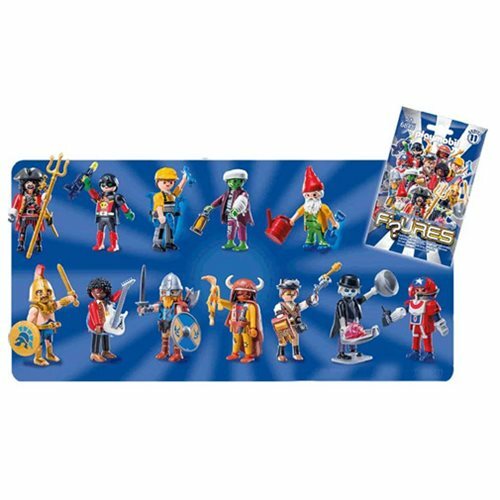 Boys series 11 case may include Gladiator, Flame Skull Adventurer, Steam Punk Fan, Undead Monster, Pirate, Zombie Butler, American Hero, Garden Gnome, Construction Worker, Viking, Rock and Roller, and Buffalo Warrior. Case includes 48 individually bagged figures.